Members of the Pacific Ridge Boys and Girls Varsity Basketball teams took time over the holiday break to give back. 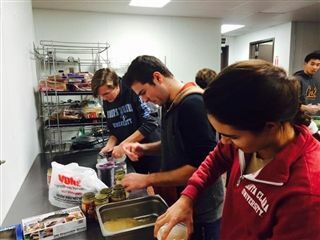 On December 28th, the student-athletes prepared and served food at La Posada de Guadalupe, a shelter for homeless men and farm workers in Carlsbad. After dinner, the students had an opportunity to sit down and chat with the residents, and senior Catherine Ames and alumnus Sebastian Green led the group in a round of holiday songs. A special thank you to the Gottesman family, who generously donated food from their restaurant for the meal, and to Mrs. Green who helped organize the evening.